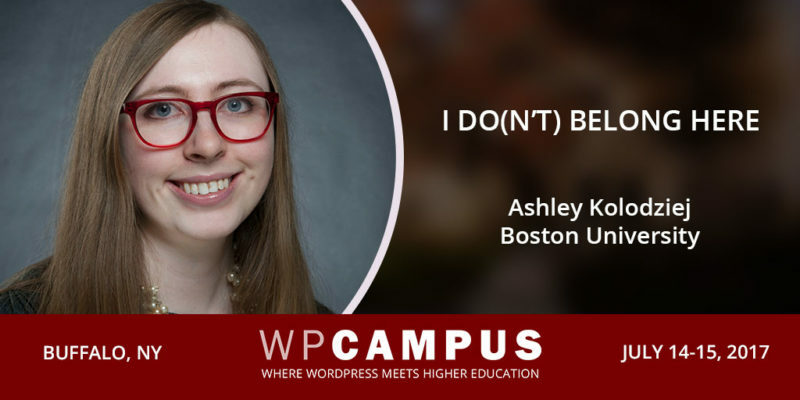 Ashley Kolodziej will be joining us at WPCampus 2017 to share I do(n’t) belong here. You can see her in action on Friday, July 14 at 11:30 a.m. I can’t remember my first web project specifically. There were a couple of tiny ones for school all mashed up together. While that was happening, I worked in night production and design at my school’s newspaper, which was okay. But there was a different department, online design and development, that worked on the website and were super mysterious with a really intimidating developer boss. I hated that the developer intimidated me and made me feel dumb when I asked questions about our website’s CMS, so I decided to start learning how to code so he didn’t have that power over me anymore. And in the process, I found a rabbit hole of really cool and interesting stuff that I haven’t been able to let go of since. I love the atmosphere of learning and teaching from each other in tech, and that’s amplified in higher education. It’s all about learning, questioning why things are the way they are, and improving things where we can. Higher education goes “slowly,” but what I’ve found it really means is that people are thoughtful and careful with their resources, and really want to do the right thing if they’re going to devote resources to it. That’s a really good match for the way I like to work. And besides that, it’s a cause I believe in. I’m speaking about imposter syndrome, or that feeling you get that you don’t deserve to be where you are, and that you are definitely going to screw it up any minute now because you have no business doing what you’re doing. I didn’t actually realize until a few years ago that there was a name for this, or other people felt it. And more than anything, learning those things – that it has a name, and I’m not alone – helped me be more okay with those feelings. So I think it’s only fair that I give my own story and perspective back, so other people can come to terms with it too. I’ve read many blog posts and articles about it, and sometimes I think they paint this overly rosy picture of it, like if you could just do this one thing, you would be over it and never have to feel it again. I don’t think that’s ever going to be a possibility for me, and it’s not for lack of trying. So it’s really important to me to present this from an honest perspective and admit that you don’t “beat” imposter syndrome, but you do grow to understand it. I mostly follow friends and people I meet or see around conferences because they usually have interesting things to say about the web, local news or police organizations. But my two personal favorites are @SavedYouAClick because it’s hilarious and fights clickbait, and @TheDailyBunny because bunnies are the best way to break up a Twitter feed that’s a little too serious. I love it for all the same reasons I love working in education – with the added bonus that people are incredibly smart and resourceful, and share so many great ideas. It’s really inspiring! Plus it’s great to hear from others who are trying to solve similar problems as I am. Education often gets a bad rap, but look at what people are doing in here and you’ll see people that are really pushing boundaries with WordPress and what they have to work with. I would 100% want a rabbit wapuu holding an Octocat plush! I’m a huge fan of code reviews right now, and obviously it needs to be a rabbit because my buns are life. Sublime Text! I practically live in it. But GitHub pull requests are a very close second for making code review easy.